By Tsukihime, May 29, 2012 in Completed Scripts/Plugins/etc. This script provides basic magic junction functionality. Magic can be used to increase your stats. The bonus that you receive depends on how many units of that magic you have, as well as the junction bonus for that stat. For example, "Life II" may provide large bonuses for "max HP" stat, but very little bonuses for "atk" or "def". Or possibly even negative bonuses. Currently it supports the 8 basic parameters. Support for xparams and sparams will come later. To junction magic, first you must obtain magic units. Then, go to your menu and select the "Junction" menu. ...Wow. Just wow. Are you a machine or something? Nce one, mate. Nice one. Man, half of your scripts don't fit the game i'm making. And with each new release (Monster Hunter, This) I keep designing my next game in my head. Hah! Keep up the good work. Seriously loving these FF8 scripts. I just had two questions in mind though..
Firstly, is that when you junction magic, perhaps you could gain some kind of tolerance to that magical element? So say, I junctioned 20 Fires to defence, that it would grant 20% tolerance towards physical fire attacks? Secondly, do you have plans to do more attributes that you can junction too? Maybe stuff like accuracy, or weapon(So that you can gain firestrikes, etc.)? Elemental properties in the game is handled strangely. 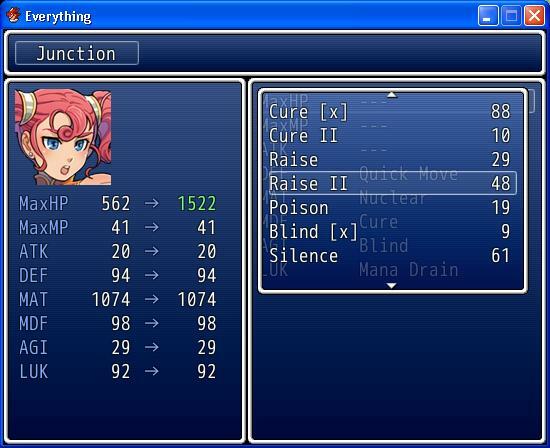 Everything is based on vulnerability, so the higher the elemental rating, the more damage you take. Similarly, lower rating (eg: 0% fire) means you take no fire damage. So defense is possible to implement, but attack isn't. For the rest of the parameters (sparam and xparam), I thought about doing them and have left space for them as separate commands (so you can just scroll through each page), but not sure if I will get to it. Maybe someone else can write an extension. Is there a possibility for an "Optimise" option where that would automatically assign the magic to the stats that where it has the best affinity? e.g. selecting Health would mean the magic would be junctioned to the stats so that the HP has priority over the other stats. I can't think of a good optimization algorithm. The brute force method would be to just check every possible magic against every field, but that's silly. If I Recall Correctly, Element Rates are just Attribute on Attack in VX Ace. Don't Recall if Fire Strike etc had rates in FF8 but you could use another script to have the overall power of that particular element be enhanced. (Craze did this with his Elements Booster script found here http://crazescriptas.../rmvxa-scripts/.) A simple invisible autostate alongside this script when junctioning elemental attributes should achieve the same effect to an extent. I've asked this before in the script support forums, but here goes nothing: Is it possible to remove Max MP from the junction menus? Since MP isn't used at all with Magic Units...? Do you still have this script?